It didn’t take me long to bump into the small, yet very dynamic English language theatre scene in Barcelona. A surprising amount of Anglophone actors and performers live and work in the city and Tinta Roja is a regular venue for their plays and improv comedy events. Just walking in, you feel you have entered a theatre space; the decor and evident sound-proofing take you to a state of suspended disbelief. The bar area at the front is very welcoming and I find the staff are always friendly – even if you just come for a drink it’s a great place to hang out with friends or simply warm up before heading out to party in Poble Sec. 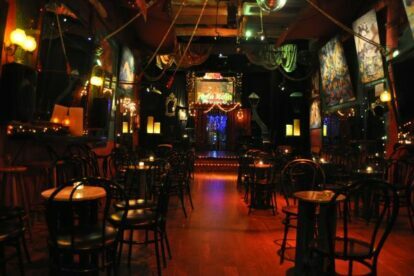 If you are coming for a show, then I suggest you take a moment before the lights dim and absorb the very evocative theatre space at the back, it has a plush circus-stroke-Steam Punk vibe I like very much. Tinta Roja touts itself as an Argentinian bar, so of course they have regular tango and milonga events where you can come and show your dance skills or, if you are a clumsy beginner like me, sign up for a class.